Hotlink is currently having a promotion that offers you 100% extra data when you purchase selected monthly internet passes from the telco. The catch? The free data is only available for night owls. From today, 12 March 2015 till 30 April 2015, sign up to a 1GB, 2GB or a 3GB mobile internet pass, and get 100% extra data completely free. The free data can only be used from 12am to 7am, sounds perfect for those who like to browse the internet on your mobile device until you fall asleep. 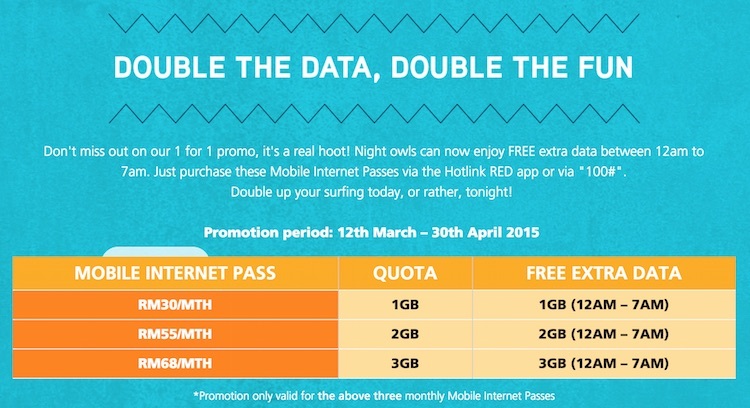 Hotlink also has other mobile internet passes, but the free 100% of data is only valid for its Monthly RM30, Monthly RM55 and Monthly RM68 plans. Some terms and conditions you should be aware of, you can purchase as many mobile internet passes as you wish. The data, including the free data, will be stacked and can be used during the Mobile Internet Pass validity period. If you are already on a monthly data plan from Hotlink, do unsubscribe and resubscribe to this promotion plan to enjoy the free data. Do be careful though, if you are not a #Hotlink user, should you run out of free/mobile internet quota, you will be charged at a pay-per-use basis. In addition to its 1 for 1 promo, Hotlink also has Facebook passes that lets you stay connected on Facebook and Twitter from as low as RM1 a day. 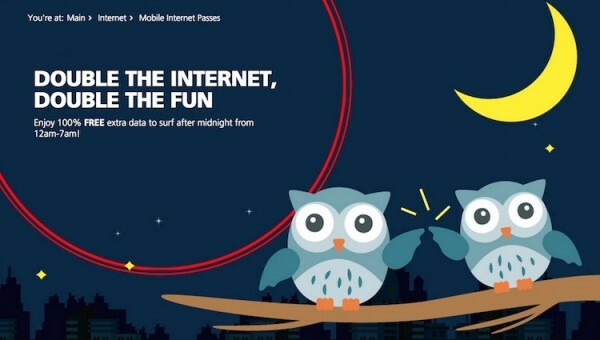 The passes offers unlimited high speed internet for use on Facebook and Twitter. These passes are only available for Facebook (native Facebook iOS and Android mobile), Twitter (native Twitter Android app and Twitter mobile) only. The unlimited data offered is not available for Twitter on iOS, Twitter’s full website, and all outside links of Facebook and Twitter (except for pic.twitter.com), so do be careful of your usage. Visit Hotlink to find out more about its promotions.